Today Michelin dedicated a new South Carolina factory to making the Tweel; a "tire/wheel" that uses flexible spindles where a conventional tire holds air. The Tweel can never go flat and never be punctured, and after talking about it for a decade Michelin is finally going to start making it in quantities. We've seen Tweels tested on just about everything from wheelchairs to lunar rovers, and they've even already been sold to consumers for small skid-steer loader construction vehicles. Michelin's Vice President of Tweel Technologies Ralph Dimenna told Greenville News they've sold "thousands" for that application, and that the company has run up to the limit they could produce with "prototype-making equipment." 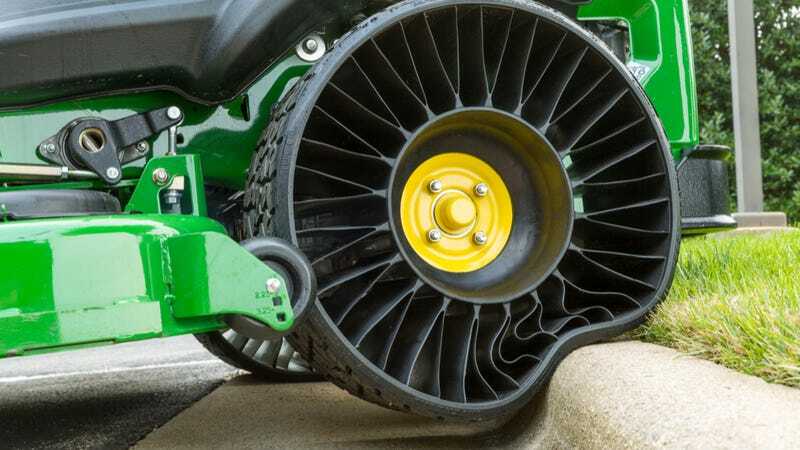 Apparently the Tweel is a dream the Michelin's keen to keep chasing, because as of today the company's allocated $50 million, a 135,000 square-foot facility, and 100 staff members dedicated to consistently producing Tweels. Dimenna went on to say the Tweel is focused on "lower-speed, off-road applications where downtime from flat tires is a concern," though former Michelin research director Ralph Hulseman thinks the Tweel will see duty on passenger cars at some point in the future. For now, the Tweel will be the OEM "tire" on the John Deere ZTrak 900 lawn mower.